The 2-star Chateau Zevgoli is a comfortable and stylish hotel situated in the heart of the Old Town, next to the Glezou tower and just five minutes' walk to the seafront. The hotel is built according to the Cycladic architecture, it is just 500 m from Grotta Beach and offers magnificent view to the magic blue of the Aegean Sea. 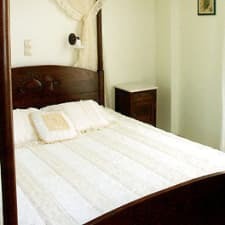 Hotel Chateau Zevgoli offers 10 comfortable and fully furnished double and triple rooms and a suite. They are all fully equipped with bathroom, direct dial phone, air-conditioning, hairdryer and safe deposit box. Most of the rooms also have mini bar and fridge. All of the rooms offer superior view to the sea, the castle and the countryside. Hotel facilities include 24-hrs reception desk, bar, living room, cafe and patio. All indoor areas are fully air-conditioned. Smoking and non-smoking areas are available. Services include daily maid, room service, car rental service. Fax and transfer service on request. Distances: Naxos Airport: 2 km; Naxos Port: 300 m; Grotta Beach: 300 m; supermarket: 150 m; bus stop: 200 m; taverns, cafes and restaurants: 50 m.